You’re never too old or young to enjoy a snow or sand castle sculpture building contest. It’s a fun way to raise money. Plus, since the material is free, that makes it an even better way to raise funds. Here are a few ideas to get you started making money for your organization. One of the best ways to get people excited about a sand/snow sculpture is to either find someone that gives lessons or can build a work of art. This draws people because they not only get to meet the person that is so good, but also learn a few things. Lessons are another great way to raise funds, the artist may even donate their skills and time if you ask. 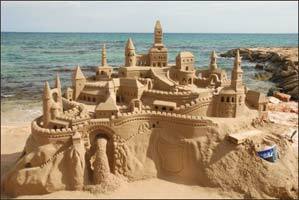 If possible you may want to have prebuilt sand/snow castles to inspire your participants. This will give your participants a good idea and for those that are just out having fun it will give them something to have a good time with. You may want to check with the local government about the reservation of beach space or park space to hold your contest. Most cities will allow organizations to hold fundraisers by contacting the city office with the pertinent information. Individuals can enter or teams can enter. The entrance fee for individuals could be as little as $25.00 and as much as you want. Teams could be charged per person or they could get a break and pay $20.00 per person. Visit with local beach/resort gift shops and businesses to try and get donations. By taking donations you will be able to make more from the fundraiser and the business will receive advertisement for their participation. For additional funds you may have refreshments, allow vendors and photos. Remember these events draw crowds so you can charge admission and/or find things to sell to the people watching the event, since this can be a large source of revenue.